"That big band sound makes you happy." 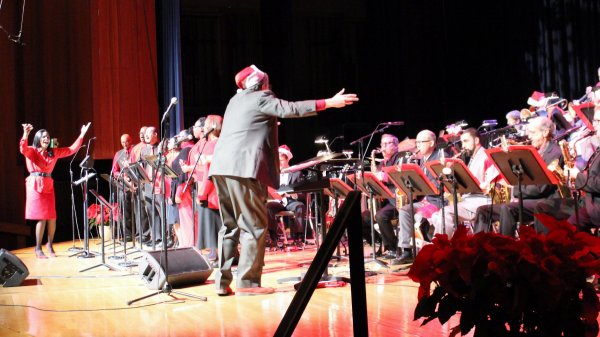 Every year the Reno Jazz Orchestra (RJO) loves to host a holiday concert celebrating friends, family, and community. 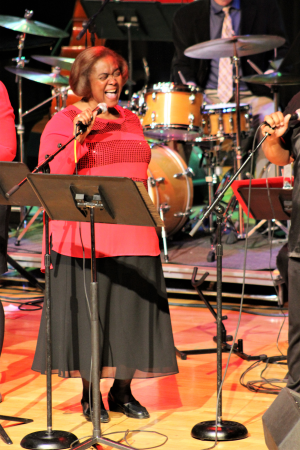 We are pleased to announce Pat Ester’s Gospel Choir will rejoin us in “Jazz for the Holidays – A Gospel Christmas”. The performances are December 16th (7:30 PM), 17th (2:00 PM) at the Cargo Concert Hall in the Whitney Peak hotel, and 20th (7:00 PM) at Squaw Valley’s Olympic Village. Jazz and Gospel, like much of American music, have their roots in the blues. Both are joyful and when brought together a new, unforgettable, vibe happens that breaks the invisible barrier between audience and performer. Those who joined us last year know what I mean. It is an honor to work with Pat Ester’s Gospel choir under the direction of Lori Johnson. Since jazz musicians and gospel singers rarely get a chance to join forces, this program is very special. In a previous article I shared a bit of jazz’s one-hundred-year history so let’s talk about gospel. It goes back a bit further. “Rock of Ages” and “Amazing Grace” were written in the 1700’s by two members of the Anglican church and, though not originally written for gospel choirs, they are two of gospel’s most famous songs. What we know of as gospel music had it’s beginning in the mid-1800s. Evangelist Dwight L. Moody believed hymns should be understandable with memorable melodies. When Mr. Moody heard Ira D. Sankey singing at a YMCA convention in 1870 he knew he met the voice to implement his new ideas. Mr. Sankey’s music got the parishioners personally involved by singing, clapping and stomping their feet. Many of Mr. Sankey’s songs were published in the 1874 “Gospel Songs. A Choice Collection of Hymns and Tunes” which is considered the first published gospel songbook. It was not until after the turn of the century that jazz found its way into gospel music. “Arizona” Juanita Dranes introduced boogie and ragtime to gospel beginning with her 1926 solo recordings for Okeh records. She also introduced the piano accompaniment to gospel choirs and was one the first professional woman gospel singers. Gospel choirs are an incubator for some of America’s greatest popular singers. Aretha Franklin, Whitney Houston, Usher, Diana Ross, John Legend, Little Richard, and Faith Evans, just to name a few, got their start in the choir. Rock and Roll legends Elvis Presley and Jerry Lee Louis both acknowledged gospel’s influence on their music. There is a long gospel tradition in Reno and the “best of the best” concept started in the early seventies when Dr. Jesse Hall brought together choir members from many churches to create the Interfaith Gospel Choir. This was an annual event that had its start at the Pioneer Theater and lasted twenty-five years. Dr. Hall was more than a choir director, but an educator as well. Jesse Hall Elementary School is named in his honor. Though the Interfaith Choir is not active anymore the tradition continues with the annual Juneteenth event in Wingfield Park. Many gospel choirs participate in a day celebrating African American culture. Pat Esters was a founding member of both the Interfaith Gospel Choir and Juneteenth. Her passion for keeping gospel music vibrant in our community matches that of the RJO’s passion for jazz. A pretty good match! Down to earth and always upbeat, Pat Esters has the talent and tenacity to light up any audience that appreciates her unique vocal talent in jazz, blues, and soul that transcends musical borders. Pat has performed in numerous productions either as a leader of her own group, back-up singer for the likes of Michael Bolton and Martha Reeves, featured with the Reno Philharmonic, and of course the Reno Jazz Orchestra. She is as respected for her musical talents as she is an educator in the Washoe County School District where she taught grades three through eight while producing and directing two musicals a year. I have known Pat for many years and it is a joy to work with her and the choir. Directing the choir is Lori Johnson. She has become an RJO veteran, performing and creating choir arrangements for our productions of Porgy and Bess, “A Gospel Christmas”, and this summer’s “Roots in the Blues”. Lori grew up under church pews in Washington D.C. and from the age of 5 up, all she remembers is music. Like most military families, hers moved often and when they were stationed at the Alconbury England air force base the choir couldn’t get a rhythm correctly so at the young age of eleven Lori stepped in and solved the problem. Her first adult choir directing experience! She has been directing gospel choirs ever since and moved to Reno in 2006 where she has been a welcome addition. What can you expect to hear when jazz meets gospel? How about the Count Basie Orchestra’s take on “Jingle Bells” and an innovative arrangement of “What Child is This” featuring both the band and choir. There will be a full serving of gospel with traditional carols such as “Hark the Herald Angels Sing” and “Little Drummer Boy”. Pat Esters is featured on Donny Hathaway’s “Someday We’ll All Be Free” and Diana Ross’ “Ain’t No Mountain High Enough”. You will hear great solo voices throughout the evening. Choir members David Wells, Marsha Dupree, Sheila Leijon, and Choir Director Lori Johnson all take turns in the spotlight. But I saved a special surprise for last…. Some very good friends are joining us. Since their inception in 2006, the Reno Youth Jazz Orchestra (RYJO) have opened our holiday show and we are happy to say they will be back again this year. To learn more, visit our website www.renojazzorchestra.org and great ready to feel the spirit! Look forward to upcoming events! The RJO Blog gives our fans up-to-date news and interesting articles about this great organization. Welcome!